Spending a week in Seattle, with a bunch of people who know the city like the back of their hand, was so much fun! I came with my husband, Jason Strate (@StrateSQL) to the PASS Summit, with 3300 or so DBAs and other Geeks (said in the most loving way possible). As is our tradition of traveling, we came a day early to have some time to explore, though we didn’t get too much done on Sunday when we came in. Instead, we ran into “Colin the Canadian” (@ColinStasiuk), had lunch with him, etc. The visiting with him and other people in the community was well worth it! I got to meet a bunch of people I had only seen and talked to on twitter. We ate at the Tap House Grill. I wouldn’t recommend the Dungeness crab mac & cheese. It sounded like it would be awesome, but it wasn’t. It was fairly bland, and not at all cheesy. Disappointing. Anyhow, Pat Wright (@sqlasylum) and Tim Ford (@sqlagentman) put together a photo walk. Apparently, this is something they do every year. They plot out areas to bring people to, and everyone takes pictures. We were supposed to go to a park, but it was raining (I know, shocking, rain in Seattle). Instead, we went to a room in the convention center, and Pat gave us a lesson on photography. I tried to take notes, but ended up acting as a model (really just goofing off while people snapped pictures of my good friend Jes Borland [@grrl_geek] and I). I will share the notes I got up to that point. 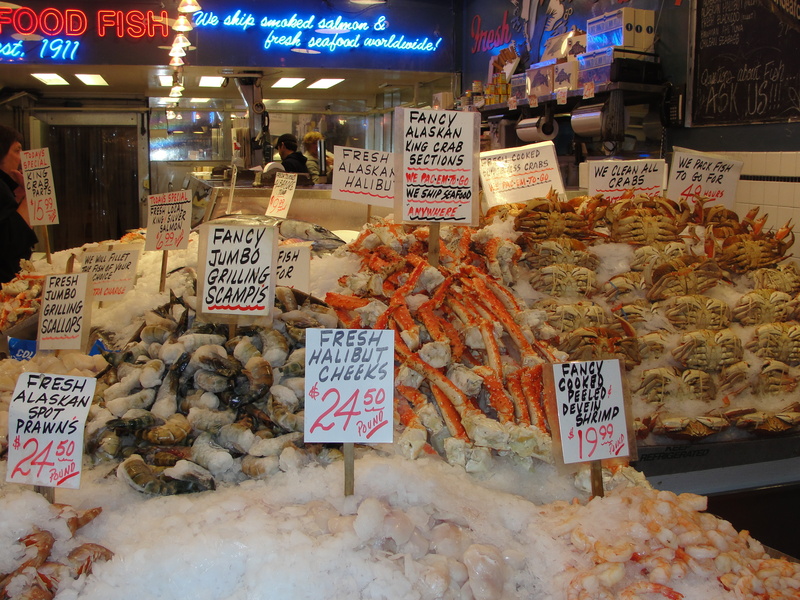 After the mini-lesson on taking decent pictures with our “drunk n’ shoot” – oops I mean, “point and shoot” cameras, as well as the better cameras out there, we headed to Pike Place Market for some photo ops. 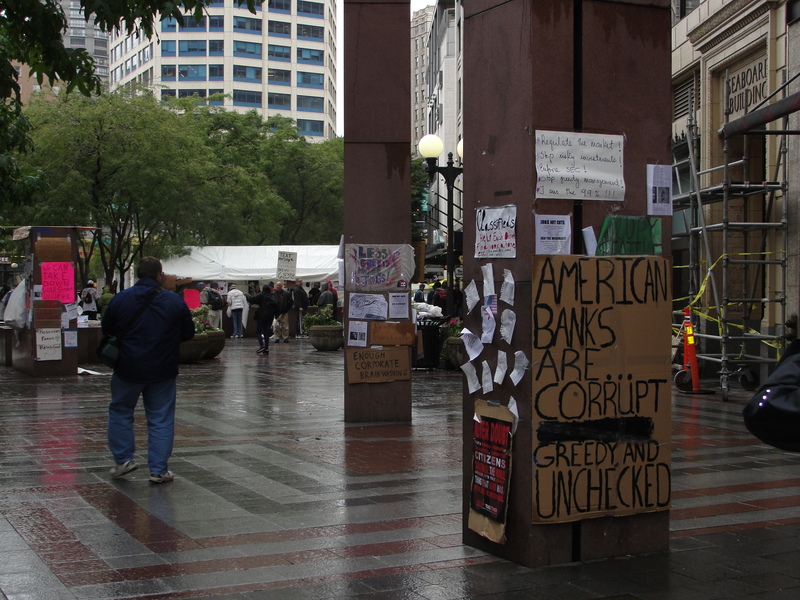 On the way down to Pike Place, we walked through the area that the Occupy Seattle protests were going on. I always enjoy exploring new cities when we visit them, and having protests going on, made it that much more interesting. The protests reminded me some of a mini-Woodstock, minus the actual concerts. The people that were staying there in tents, etc. looked very grungy – hippie-ish, really. They were standing on marble slabs, yelling about how the government needs to stop taking away their rights. There were people playing drums and dancing around. There were signs posted everywhere. I think I got some good pictures of some of them. The park they were in was pretty cool. 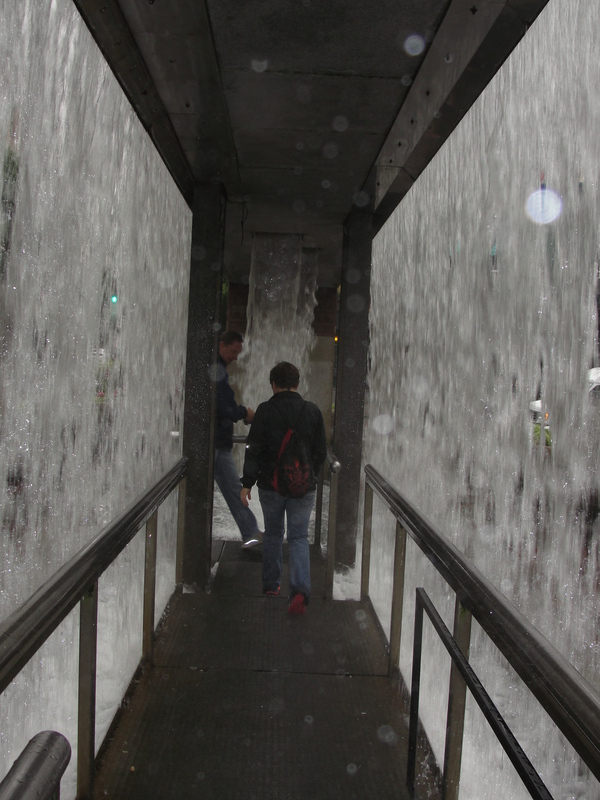 One feature, was a waterfall with a tunnel going through it. I think we would have spent a lot more time there, had the protests not been going on. 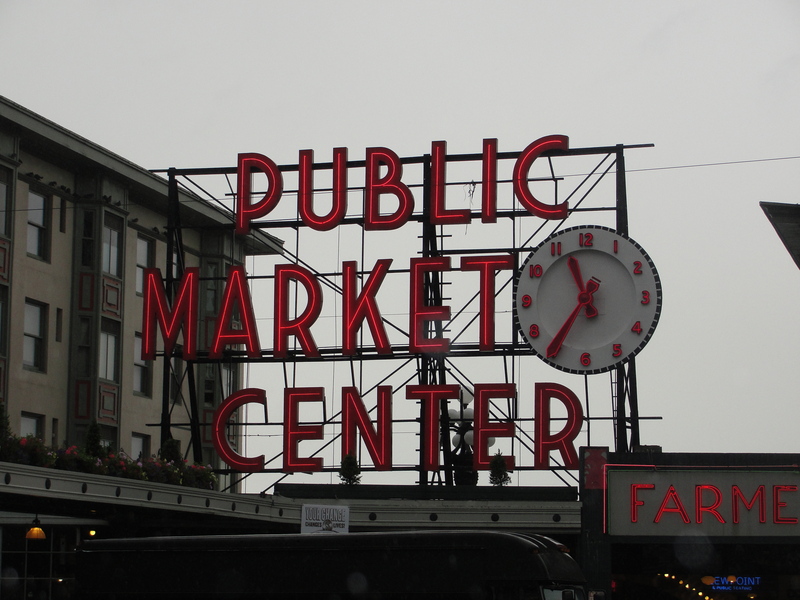 The Pike Place Market was pretty cool. It was different than I expected. It reminded me a lot of an indoor Farmer’s Market, several levels deep (literally – it goes underground, or into the side of a really steep hill, rather than up). There wasn’t as much throwing of fish as I expected, considering that is what they are known for. I got to sample some really good fruit. My favorite was the Asian pear, it was a combination of an apple and a pear. It was soft like a pear, and really sweet! The samples there were amazing! Besides the fruits, we also got samples of chocolates, delicious chocolates with chardonnay, dried cherries, and almonds. What I didn’t sample (for obvious reasons) was all the seafood – fresh caught, sitting on ice. All in all, it was a great time hanging out with friends. We explored a bit, had some amazing Russian Food from some little place in an alley way, and some coffee that bit back.